Twin success for Ariane 5 and European space industry: first Ariane 5 for the Galileo constellation and 75th successful launch in a row for this launcher! Arianespace has successfully launched satellites 15, 16, 17 and 18 in the Galileo satellite navigation system for the European Commission (DG Growth), within the scope of a contract with the European Space Agency (ESA). 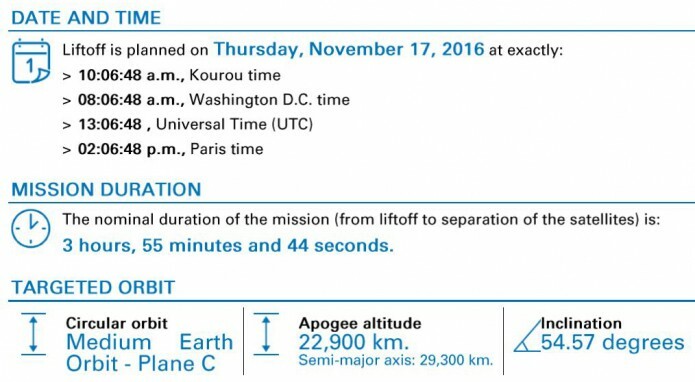 The Ariane 5 launch took place on November 17 at 10:06 a.m. (local time) from the Guiana Space Center in Kourou, French Guiana. Maroš Šefčovič, Vice President of the European Commission, and Elżbieta Bieńkowska, European Commissioner for Internal Market, Industry, Entrepreneurship and SMEs, were on hand for the launch. Today’s launch was the eighth from the Guiana Space Center for Galileo and the first using an Ariane 5 launcher (ES version). Arianespace has now orbited 18 Galileo satellites, more than two-thirds of those that will eventually be deployed by the constellation, enabling Europe’s satellite navigation system to start services as early as the end of this year. The launch was the ninth of the year for Arianespace and the sixth with Ariane 5, marking the 75th successful launch in a row for this heavy-lift launcher and surpassing the previous record set by Ariane 4. With today’s successful and doubly symbolic mission, Arianespace is proud to support Europe’s ambitious space objectives while also continuing to demonstrate its unrivaled reliability that is unparalleled in the market. Today’s mission marks the 75th successful launch in a row for Ariane 5, an all-time record for the Arianespace launcher family in French Guiana. Ariane 5 has performed 75 launches from 2003 to 2016, orbiting 149 payloads with a cumulative weight of more than 623 metric tons (about 1.4 million pounds), for both government and commercial customers. This string of successes is further proof of the exceptional reliability and availability offered by Arianespace’s heavy launcher, while confirming its position as the most reliable launcher in the commercial market. GIOVE-A and GIOVE-B experimental satellites launched by Starsem from Baikonur using a Soyuz rocket in 2005 and 2008. First Galileo IOV (In Orbit Validation) satellites, 1 and 2, performed on October 21, 2011 (VS01). Soyuz VS03 launch of Galileo IOV 3 and 4, on October 12, 2012. Launch of first two Galileo FOC satellites on August 22, 2014. Despite injection into non-compliant orbit, ESA teams were able to change orbit and conduct intensive tests. The EC must now make decision on their integration in the operational constellation. Galileo FOC 7 to 14 satellites successfully orbited on the following Soyuz launches: VS11 on March 27, 2015; VS12 on September 10, 2015; VS13 on December 17, 2015; and VS15 on May 24, 2016. Today’s launch is the first Ariane 5 (ES version) mission for the Galileo program. By successfully orbiting four more satellites for the Galileo constellation, Ariane 5 has demonstrated its flexibility and adaptability: the restartable EPS upper stage, and the new dispenser specially developed by Airbus Safran Launchers to hold the four satellites under the launcher’s fairing and release them in pairs, both operating flawlessly. Arianespace will subsequently deploy the next eight satellites in the constellation, now under construction by OHB in Bremen, Germany, with two more Ariane 5 launches in the second half of 2017 and in early 2018. Europe initiated the Galileo program to develop a new global navigation satellite system. Under civilian control, it will offer a guaranteed, high-precision positioning service. The Galileo system is designed to provide a European solution as an alternative to the American GPS (Global Positioning System). It will be based on a fleet of 24 operational satellites (along with replacement satellites), 18 of which have already been orbited by Arianespace. Galileo features innovative technologies developed in Europe to benefit all citizens. It is funded by the European Union. On October 26, the European Union unveiled its long-term space strategy with a strong reference to the upcoming Ariane 6 and Vega C launchers, as well as the associated launch infrastructures. On November 9, ESA and Airbus Safran Launchers signed an agreement confirming the Ariane 6 program. The first flight of this new launcher is slated for 2020, paving the way for Arianespace to start marketing launches as early as the end of this year. With nine more satellite launches in the order book managed within the scope of contracts conducted by ESA (one Sentinel-2B mission and two Galileo missions), the European Commission retains its position as Arianespace’s leading government customer. Shortly after the announcement of the orbital injection of the four satellites, Stéphane Israël, Chairman and CEO of Arianespace, said: “Congratulations Europe! Four more Galileo satellites are now in orbit with our eighth launch for the constellation, also the third of the year for the European Commission and ESA. 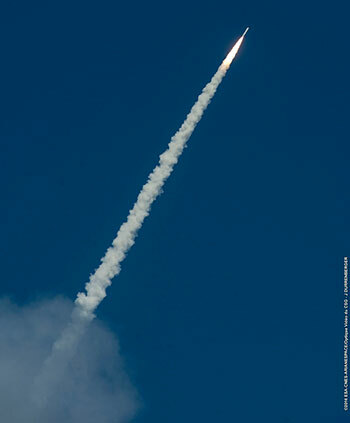 Arianespace is proud to guarantee independent access to space for Europe. Providing a highly complementary fit with Soyuz launcher from CSG, the Ariane 5 ES launcher is taking over responsibility for the deployment of Galileo, marking another step towards European independence in satellite navigation. I would like to thank the European Union, especially the European Commission’s DG Growth, as well as the European Space Agency, our direct customer for this launch, for continuing to entrust us with their satellites. Coming shortly after the publication of the European Union’s space strategy, we were very honored to welcome Vice President Šefčovič and Commissioner Bieńkowska to witness this launch. The James Webb Space Telescope (JWST), within the scope of a partnership between ESA, the U.S. National Aeronautics and Space Administration (NASA) and the Canadian Space Agency. The 15th to 18th satellites were built by prime contractor OHB System in Bremen, Germany, with the payloads supplied by UK-based SSTL (Surrey Satellite Technology Ltd., 99 percent owned by Airbus Defence and Space). The satellites weighed 714, 715, 714 and 715 kg. at launch, respectively, and were placed in a circular medium Earth orbit (MEO) in Plane C, at an altitude of 22,922 km. and an inclination of 54.57 degrees. They will subsequently be moved to their operational orbit at an altitude of 23,222 km. Arianespace uses space to make life better on Earth by providing launch services for all types of satellites into all orbits. It has orbited more than 540 satellites since 1980, using its family of three launchers, Ariane, Soyuz and Vega, from launch sites in French Guiana (South America) and Baikonur, Kazakhstan. Arianespace is headquartered in Evry, near Paris, and has a technical facility at the Guiana Space Center, Europe’s Spaceport in French Guiana, plus local offices in Washington, D.C., Tokyo and Singapore. Lancement VA233 : coup double pour arianespace et l’Europe spatiale, avec le premier lancement reussi d’Ariane 5 au profit de Galileo et le 75e succes d’affilee de ce lanceur !